What is this little article for? Sometimes we should remember that we live in an ocean of sound that is absolutely a heart of everything. Sometimes, to feel the music of the sun, wind, rain, and just music of the moment: suddenly stop and hear a beautiful melody. When did you have an idea to play in public and in the street during all seasons? 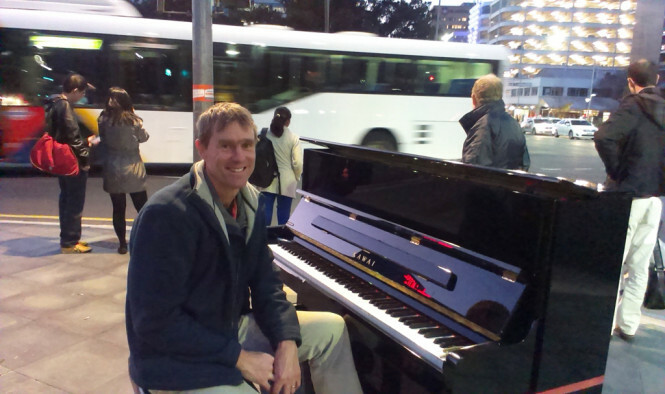 I first thought it would be nice to have a piano that I could take anywhere, and so started to work out how to do this, and then after that wondered what it would be like to take my piano busking. I started to go busking in 2001, and guess I just didn’t go busking in summer, as I don’t like being in the sun. But winter and spring and autumn all have been good to play music in. Sometimes though my piano doesn’t like it when it is raining a lot in winter as the piano mechanism starts to seize up! Re busking all the time, I guess I tried it and found out that I could get paid enough from it to do it seriously too, so in about 2008 I started busking more often and in 2010 I started to busk as my job. Where did you study music? Who is your favorite composer? I started to learn the piano when I was 11, by having piano lessons, and did up to grade 7 in piano and grade 5 in theory. I also learnt the violin and trumpet before the piano, though only for a few years. I’ve also studied a year long course in contemporary music, back in 1998. I have quite a few favorite musicians (not so much composers) — Michael W Smith, and Geoff Bullock would be 2 of them. They are both Christian piano/ synthesizer players. Michael W Smith is from the USA and Geoff Bullock is from Australia. Though I do like lots of others, such as Cyndi Lauper, Elton John, Amy Grant, Moby, Toby Mac etc… So a wide range of musicians. What’s your main occupation in life? 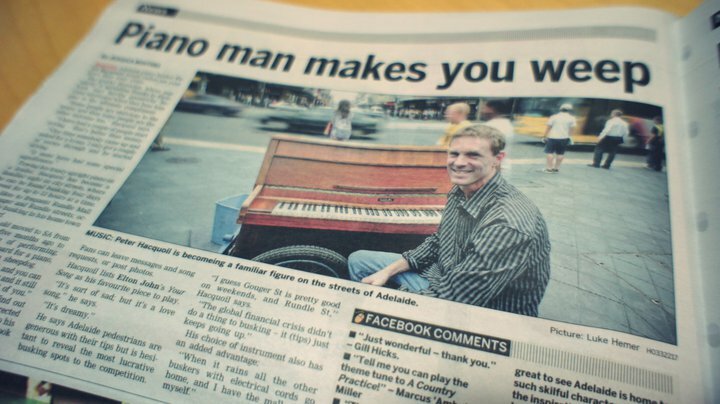 My occupation is piano player. What do you feel playing the piano? All sorts of things – I love sad music and have a saying «I play best when depressed», which is true. But feelings can be all sorts — sad, depressed, happy, excited, mellow, and sometimes nothing at all. There is music to suit all feelings. I often think in pictures when I play too, so pictures that are connected with feelings, and the music that comes out often tells a story. What do you dream about? Have all your dreams come true? I guess I have dreams re how I want to be with my wife and kids (happily getting on with) and with the Lord (happily getting on with) and music is connected with these things, in various ways. One way is that I could be paid well in music, so I can spend more time with my family. Another is that people will be affected in good ways by the music I play. 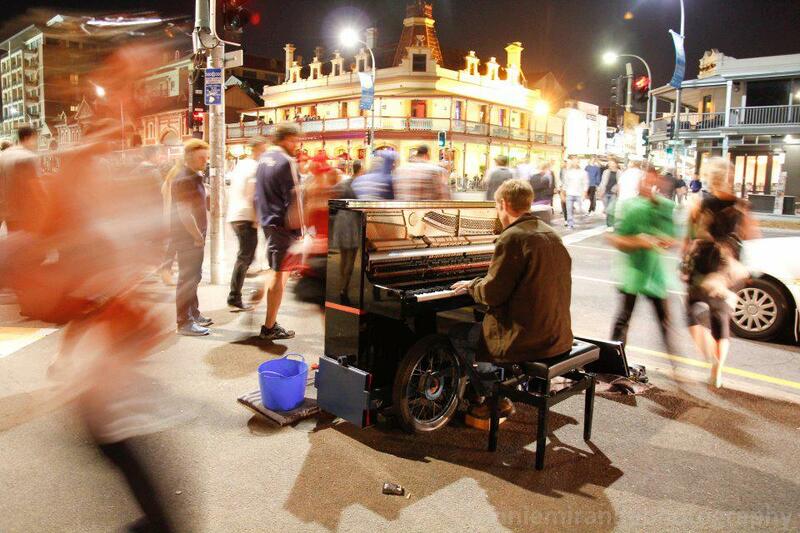 I would also love to go busking with a grand piano one day too! Some of my dreams haven’t happened but I can see how they can happen. What is the best comment about your hobby? From my point of view, or what other people may have said? I love it when people write little notes on pieces of paper and drop them in with the coins. I guess different things. To start, I see that the Lord made me to make music, and I see him as the original creative being (amongst other things). So ultimately, I make music by talking to him, and I also talk to other people through music. Different emotions and situations also inspire me. Nature also gets me excited in music, so I love to play around sunset time, and playing a piano outside with the sunset is beautiful! I guess people inspire me too – I like to watch people and make music that reflects and influences what they are doing. What are your wishes to everyone on the Earth and your city? Wishes to everyone – I don’t have much really, as I think people will make their own minds up and so I can’t see much changing re the state of the earth. Re my city (Adelaide) – that it would evolve in a way that is good for people.